I am always excited when I see this truck around L street. The Reuben's are fat and delicious and totally worth the wait. Only suggestion, the meat could be sliced thinner. Keep up the good work!! Finally a good deli in DC! 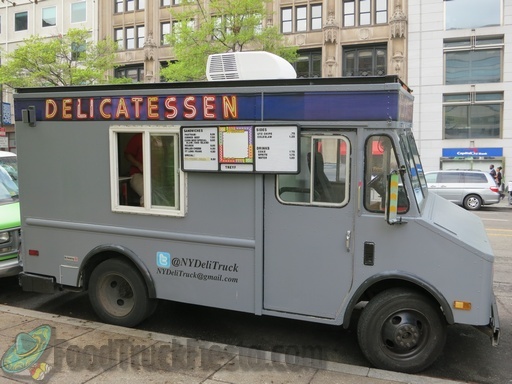 The best Pastrami in DC is off a truck. I ordered the corned beef special that comes with Russian dressing and cole slaw. This was just a corned beef sandwich with mustard. Wrong order - seems ridiculous to me when the service was really slow. Also, the meat is really thick and chewy. Just difficult to eat. It also had a ton of thick fat on each piece. Needs improvement. Valiante effort and great concept. However it's just not NY corned beef. The pastrami and corned beef doesn't have that juicy crumble quality you normally get in a Jewish deli, instead it's chewy. I prefer thick cut, however this was too hard to eat. Keep working at it. The pastrami sandwich I had was decent, and the service was good. However, an REAL NY deli sandwich is a massive pile of thinly shaved meat; this was a fairly small amount of thicker meat. It tasted fine, but it was a bit tough and was not a very good value for the amount of money paid. I have never found a seriously good pastrami or corned beef sandwich in DC, and the search continues. Serving up classic New York deli fare, hot sandwiches, premium hand sliced meats.